I am lucky to live in the middle of a coniferous forest. The trees stay green year round. 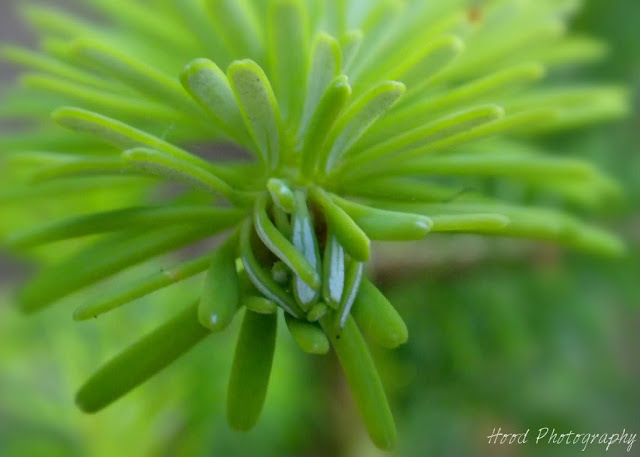 This photo is of the very tip of the fresh new growth at the tip of a branch. Very nice. Wish I could visit there now and see my daughter! The sweet incense of the conifers is a great perk for living in the forest. Nice shot. Nice shot! Joining you from sweet shot Tues, as a fellow Oregonian! love the green. a beautiful, refreshing photo. YES, all three call me Tutu. Well, the baby can't talk yet, but her parents call me that, so it's definitely sticking! What a fascinating photo. Love the color. Thanks for sharing. New growth is always so beautiful! Nice macro. WOW. Gorgeous all around! Hello fellow Oregonian! So fun to meet other's that live close by! So glad I saw ya on Sweet Shot, I usually link up, but not enough hours in the days this week. Just beautiful!! Would love to visit your area of our country some day. Love the color and detail. Thank you for sharing! WoW! Catching up with ABC. PS.. COMMENTS makes me happy! A beautiful shot, love that glaucous finish on the needles.